For centuries, the art of Wayang (traditional shadow puppets) has become an inseparable part of the lives of the people on the islands of Java and Bali and is a prominent part of Indonesian culture. This long-lived art is among the world's greatest story-telling tradition. 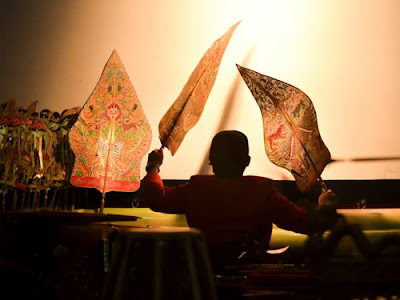 It comes in the form of theater (wayang orang), three-dimensional wooden puppets theatre (wayang golek), and the most distinguished one: leather puppet shadow theatre (wayang kulit). While wayang golek is mostly associated with the Sundanese in West Java Province, wayang kulit is the outstanding art of the Javanese in Central Java, Yogyakarta, East Java as well as Bali. Today Wayang orang and wayang kulit performances are still regularly held at the Keraton or Sultan's Palace of Yogyakarta and Keraton Solo. 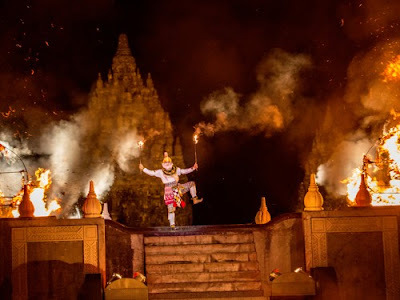 In wayang orang, actors usually wear the mask of the character they portray, whereas, in the dramatic Ramayana dance legend which is regularly performed at the grand stage of the Prambanan temple, the masks are cast off. To watch this fabulous Ramayana ballet at its very best see this on full moon nights in the dry season between May through October, when the bright round moon shines directly on the elegant Prambanan temples, becoming an unforgettable backdrop to the riveting play. Nonetheless, Wayang kulit is still the most well known Indonesian wayang performance. It is made of cow's leather, meticulously chiseled with very fine tools, supported by carefully shaped buffalo horn handles and control rods. The art of creating wayang kulit is incredibly detailed. Several artists are usually involved in the different stages required to make one single puppet. VIsitors are welcome to observe and learn the intricate process in making wayang kulit in the Village of Kepuhsari, Wonogiri Regency, in Central Java. The stories in wayang kulit are brought by one sole master performer called dalang, whorelates the story and at the same time does the voice for all characters, both male and female, the good as well as the bad. He has a screen and a small oil lamp in front of him that throws shadows of the wayangs on the screen, while when not appearing, the wayang figures are stuck on a long banana stalk that can be easily taken up whenever the master needs them. Tales in wayang performances are usually taken from the Ramayana or Mahabharata Hindu epics as well as from Java's own history and legends, that usually involve moral and ethical dilemmas faced by the characters, following their journeys through life, love, and war. During the endless battle between good versus evil, they also contemplate the existential struggle between right and wrong. The means to those ends are not always clear cut. "Good" characters may possess negative traits and likewise, not all "bad" characters are entirely immoral. Whatever the circumstance, wayang stories always present philosophical ideas and poignant messages. The stories presented in wayang kulit performances that are based on the classic Hindu Saga, are commonly known as wayang purwa (classical wayang). 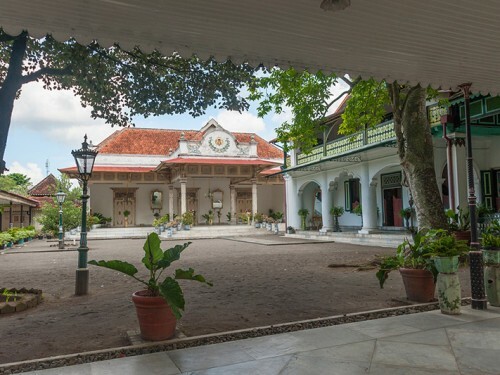 The performances refer to four cycles of epics, which were standardized by the royal courts of Central Java in the 18th century. Wayang kulit performances are grand events that last throughout the night, accompanied all the while by a live traditional gamelan orchestra. During folk festivities and significant events such as births, weddings, or other celebrations, wayang kulit performances often appear with specific messages that are relevant to the event. 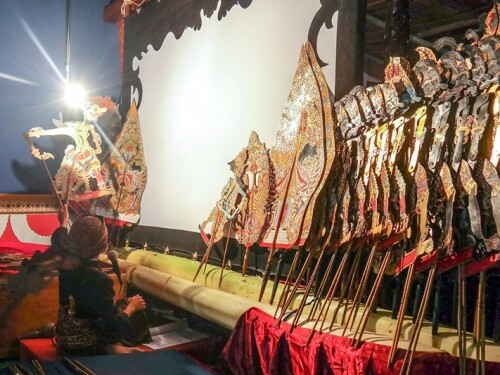 Traditionally, wayang kulit performances draw large audiences from all neighboring villages who sit on both side of the screen: the "shadow side" and the "dalang" (puppeteer) side. In the past, people typically watched from the shadow side. Today, performances are set up for the audience to watch from the dalang's side of the screen. The art of Wayang has been inscribed by UNESCO as a Masterpiece of Oral and Intangible Heritage of Humanity.